The Stronger Families Fund® concept was inspired by one family whose gift of $25,000 annually set the stage for increased commitment by our most dedicated supporters. The idea is introduced to and approved by the Development & Marketing Committee, CFS Executive Leadership and Board of Directors. The second Stronger Families Fund® $100k is pledged by an anonymous donor, in honor of Nanette Dancil, to support CFS programs on Maui. This gift is the match to the Minami’s challenge. The continued contributions by the family that inspired the fund arrives, continuing fundraising momentum and encouraging others to take action and show their support. An anonymous donor pledges $100k as a match challenge to leverage support by the already committed CFS Board of Directors. The CFS Board surpasses the match challenge and collectively pledges $500k, reinforcing their believe in the importance of private funding to support the work of CFS. The inaugural Stronger Families Fund® hui finishes strong and wraps up FY15 only one donor away from securing the first $1 million. A signing ceremony celebrating the first Stronger Families Fund® Hui is held at the Pacific Club in Honolulu. The event marks the momentous achievement of all the donors and fundraisers that committed their time and energy to establishing this fund for CFS. CFS approaches longtime donors to consider joining the Stronger Families Fund to reach the founding fund goal of $1-million. 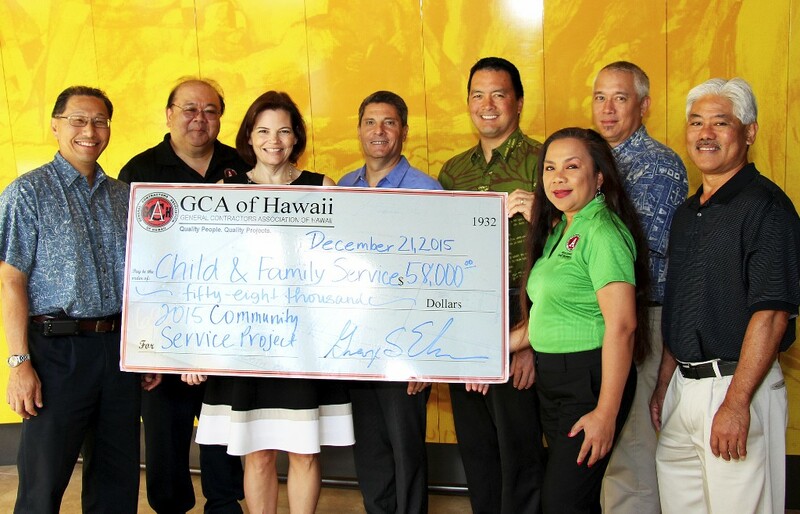 (L to R) Cedric Ota, GCA 2nd VP, Johnny Y. Higa, GCA Executive VP, Karen Tan, CFS VP of Programs, David Striph, EVP Howard Hughes Corp., Todd Apo, VP Community Dev, Howard Hughes Corp., Gladys Hagemann, GCA Deputy Director, George Ehara, GCA President and Clay Asato, GCA 1st VP. A Match Challenge from Howard Hughes Corporation & Swinerton Builders set the stage for the next Stronger Families Fund® Hui of donors.